New York in the 1960's. A new wave of Chinese immigrants is moving into Chinatown. The adoption of the new immigration act has launched the district in a demographic boom! It now reaches Canal Street to the north and Bowery Street to the east. The immigrants, hard-working men and women, are arriving by the thou- sands to buy buildings, establish businesses and fulfill the American Dream! In this game, you are one of them. With all your savings in hand, the Big Apple is up for grabs! Will you know how to use your talents and acquire the most extraordinary fortune in America? This is a negotiation game in the truest sense of the word. In it, players acquire ownership of sections of city blocks then place tiles, representing businesses, onto the block-sections. At the end of each turn, each tile you've laid gives you some sort of payout, but completed businesses (formed of three to six connected tiles of the same type) pay quite a bit better. All these resources are dealt to the players randomly, however, so players must trade to get matching businesses and adjacent locations. 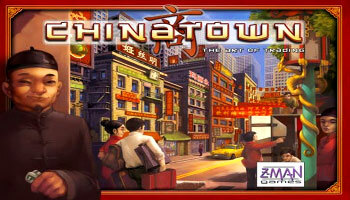 The board represents the New York Chinatown of the mid-60's. It is divided into 6 districts containing buildings numbered from 1 to 85. A game is played over 6 rounds. In each round, the players receive income from the businesses they have managed to establish. To generate the maximum income, shops of the same type need to be built on adjacent buildings.